Most real shooters need to know their weapon. I mean know it. It is not just about being able to perform immediate action drills during a jam or to peek at your gun everyday in your safe and never fire it. It is about deploying the weapon and being effective with it. I am no true “operator”, I never saw combat, I never heard a shot fired in anger but I can tell you that using Magpul furniture on all of my AR’s (5.56 and 7.62×51), I can knock it down when it counts. I attribute most of that to proper training and practice over the last 19 years of my life. This confidence comes from having equipment that I know and I am comfortable with. In the last few years Magpul has become a big part of that. Let’s look at what this company does and how they have revolutionized the custom accessory market. Magpul has really thought about functionality when making a product. When using some of the products from the competition or just “stock” AR furniture, you almost want to slap yourself in the face. It is almost like “Wow, why are these guys selling this stuff?” Some smart rifle makers, Primary Weapons Systems and others, have went with Magpul to add their kits to their rifles. I noticed at Shot Show this year that other manufacturers, like Colt, are now following suit. My first thought when I grabbed the magpul‘d out rifle was the forward hand grip. The feel of the Angled Fore Grip took some time to get used to but I am glad I worked through my initial pessimism. The new style of grip allowed me to keep better control of the rifle during the felt recoil stage of firing the rifle and allowed me to get back on target very quickly. Like I said, it took a little bit to get used to but now I like it. Let me know what you think below if you have this set up. Magpul is not the cheapest, but it is the go to for our military and police tactical experts for a reason. The stuff works and it is well thought out. We tested the MagPul MBUS Sites, The MIAD (MIssion ADaptable) Grip Kit, MagPul Angled Fore Grip, MOE Hand Guard, and the MagPul ACS Carbine Stock. All of these components met our standards. They were well built, fit the rifle very tight with no play or rattling around. They were also ergonomically pleasing to the shooter and made a day at the range a joy. I have moved through a number of pieces and I am committed to MBUS sites (front and back) for all of my weapons. I have used Troy Battle Sites in the past and I like them as well but I now prefer the MBUS sites. I have the MOE SGA Forend on my Remington 870, the MOE buttstocks in varying configurations for 5.56 and .308, and the MS3 and MS4 slings on all of the weapons as well as adapter kits for each. I am also a believer in the PMAG, which is the 30 round mag which made Magpul famous. I like the fact that Magpul did not waste an opportunity to add compartments to their furniture. Sometimes I see products and I say “Wow, they could have totally put a little compartment in that space.” but due to cost and lack of engineering vision some companies choose not to. I think this is a sign that sets Magpul apart. 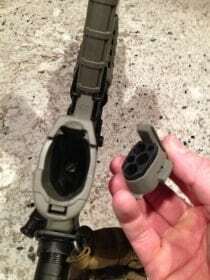 Yes, the stuff feels great when it is in your hands but it is the small details that makes Magpul great. I think they get the small details right because they spend so much time looking for feed back from real operators and professional shooters.